I read the Financial Times – the “Pink ‘un”. A “world business newspaper” which gives me the salient economic and political news I need each day. No gossip, no celebrities, no-nonsense. Politically neither left nor right, but obviously pro-business. I love it. At the weekends it provides additional supplements – on personal money, travel suggestions, house and home with adverts for furniture and expensive properties plus an FT Weekend magazine with columns on cookery, wine, philosophy, medicine, plus crosswords and quizzes. They also deliver a glossy magazine called “How to Spend it” – a tantalising opportunity to consider spending thousands of pounds on a bottle of wine, a trip to Burma, a racehorse – or a dress. Of course the magazine is at once utterly seductive – who knew they needed this IT kit, or the finest headphones in the world, or a lesson in golf from a well-known golfer? – and also a smug insiders’ catalogue that documents how the other half per cent lives. But when they cover fashion I love the sumptuous photo shoots – more upmarket than Vogue, and always of interest to me (although I never would, nor could, spend £2000+ on a garment). For me seeing such high-end clothes is exciting because they are either wonderfully tailored or feature unique fabrics. A dress is just a dress – but when you have an almost unique item, in distinctive and no expense spared fabric, beautifully constructed it is exciting. These dresses are not easy to make and require much more thought and labour than an ordinary off the peg frock. They present an interesting question – how were they made and can they be replicated? Last week How to Spend it, did silk dresses – some patchworked, some embroidered – all of them light and dreamy capturing the spirit of the 1970s. Styling by Damian Foxe and beautiful photographs by Andrew Yee. My own interest in silk dresses is that I have committed to making one as my “wildcard” for the 2015 SWAP challenge. I am working up a few ideas, so this slug of inspiration was very welcome. Here we have a range of modern tea dresses – all of them light, luxurious, feminine, tender and colourful. The St Laurent by Hedi Slimane could be recreated by using a range of hand printed silks pieced together, or the fabric could be painted or block printed in sections before construction. The African/animal prints are not in colourways that appeal to me, but you can see how the yellowish brown border pulls all the disparate features together. Also I like the floaty soft pull-over shape of the garment. The second dress – you already guessed – is Emilo Pucci. The dress is a fairly simple Mad-Men-Megan-style halter neck arranged on a metal necklace. The glorious amber and ruby print has a dramatic central panel that then explodes towards the hem of the dress. A flesh coloured underskirt give it a little body and decency, as it billows out in the sea air. This Just Cavalli dress is made from a distinctive striped cloth, where several different designs are grouped together, each united by the yellow, blue, green, black, white colour scheme. The bodice is simple but the long skirt flows open over shorts. I love this Erto dress, especially the deep sky-blue chiffon. The patterns appear random and could be replicated with painting, screen or block printing, using yellow, white, blue, navy and green. This is such a delicate, sensual look. The Dries Van Norton silk dress is also beautiful. Here it is styled with linen/cotton trousers and a silk/linen coat (over the shoulders). To me this is an object lesson in matching prints successfully. The scale of all the designs are similar but the colours are quite varied – green, yellow, orange and purple in the coat; deep red, black and white in the transparent dress; red and gold in the trousers; worn with patterned shoes. Nevertheless all that print together looks wonderful – I think because they all contain a creamy white and have an airiness about them. It makes me want to make something diaphenous and draped after the rather structured Nina Ricci dress I am making for the SWAP. I had seen a nice dress that Closet Case Files made with hand painted silk, and bought the pattern. There are some gorgeous versions of it – Vogue 8827 – out there on the internet. I am unsure if the shape is it really me – especially the waterfall front – its a bit flouncy, non? If not this pattern, any suggestions? And what about colour schemes? This is very interesting, K., and a gorgeous supplement. I especially like the Erto dress (probably the colour and pattern mostly) and surprisingly the Just Cavalli…(I don’t usually like anything Cavalli). I didn’t like the Vogue design at first but seeing Heather’s version in the lighter-coloured fabric I can see that it is a very pretty dress. I was thrown off by the dark palette of the pattern dress. I actually have a silk dress that I have had for a few years that I’ve been wanting to replicate for a while. It is a simple design and has a front self-waterfall thing that is not overblown. It’s a knee-length dress and not as diaphanous as these. I should post a picture. Whatever you pick I’m sure it will be gorgeous and fun, especially with your printing. Wow, love that silk. Yesterday I tried on a silk blouse and it felt so buttery fabulous , sadly wrong colour for me. I’d like to suggest a pattern that hugs your torso, flows over your hips. I’m guessing the flounce is not your bag. One thing I truely love about you kate is your sense of adventure. Why not do the dress over pants…wouldn’t layers on the bottom half work with such thin material? I know nothing and only hoping to spark an idea …I see a mix of your different pattern silk panting, layered, fluttering in the breeze but the sea side. Have a great day! 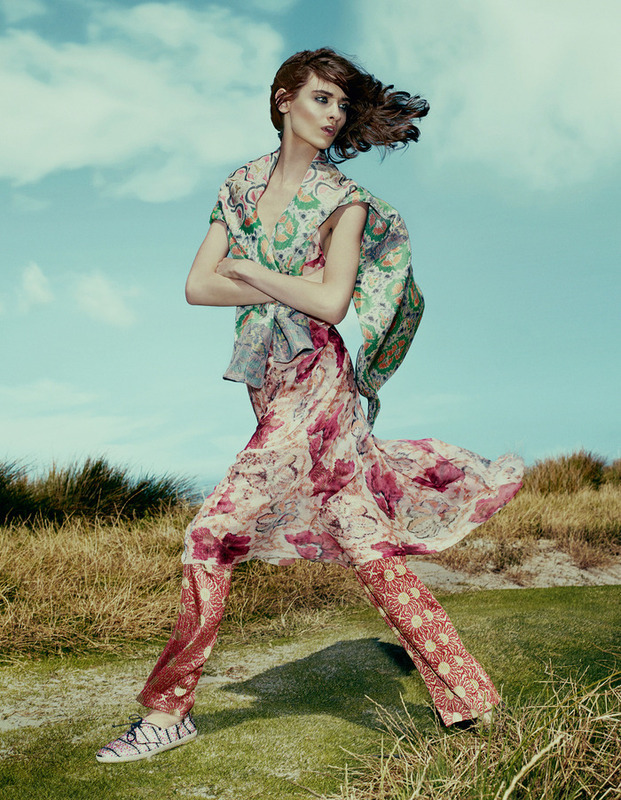 V1244 or V1301 [both Koos van den Akker] scream for diaphanous prints. As long as the silk is ultra fine, they would be lovely. I can personally vouch for the beauty of V1410 in a fine silk, much drapier and more elegant than the pattern image. V1223 is a lovely flirty offering from Ann Klein, or the more structure Guy Laroche 1339. Howzat?! Wow! A pattern library in your head Demented Fairy. Well I suppose your speciality would be fairy outfits. I will look these up and have more of a think about it. Many thanks. Oh Kate, you’ve gotta go Marfy! Many thanks dear Ruth. I will follow up on these suggestions. I was going to go on the Vogue patterns website and recommend a couple of patterns, but actually they have about 20 patterns currently that would look lovely made up in a very light silk. You certainly don’t need to make a dress with a drapey-ruffly thing hanging down the front, as they have tons of options. I can’t wait to see what you pick. Too many options when it comes to floaty flyaway chiffon creations …my head is spinning…everyone has already given great suggestions…I’m going to sit still and watch the magic you perform, Kate.